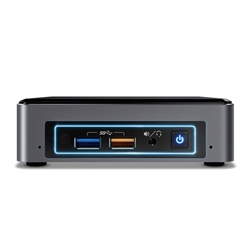 The Intel NUC7i5BNK has some cool new features including dual-array front microphones so you can take advantage of Cortana’s capabilities if you install Windows® 10 with no additional hardware needed. 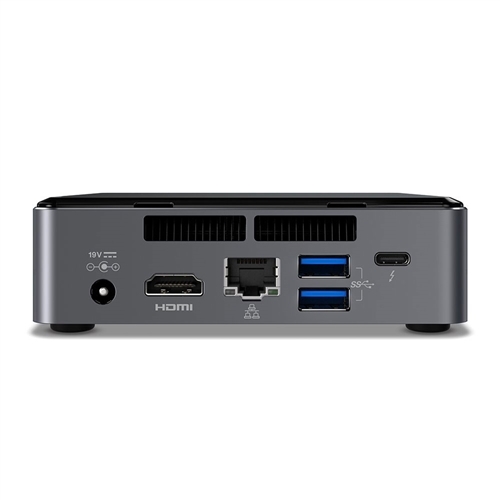 There’s also a front power button and a multi-color LED ring so you can personalize the NUC with the look you want, along with 7.1 surround sound via the HDMI port so that you can be deeply immersed in your music, movies, and games. Or listen with headphones via the front microphone/audio jack. The choice is yours. Intel® Iris™ Plus Graphics lets you see images in brilliant 4K and adds better clarity, letting you see data visualizations or on screen text in brilliant definition. The Intel NUC7i5BNK can connect up to three 4K monitors so you can spread your work out across screens. 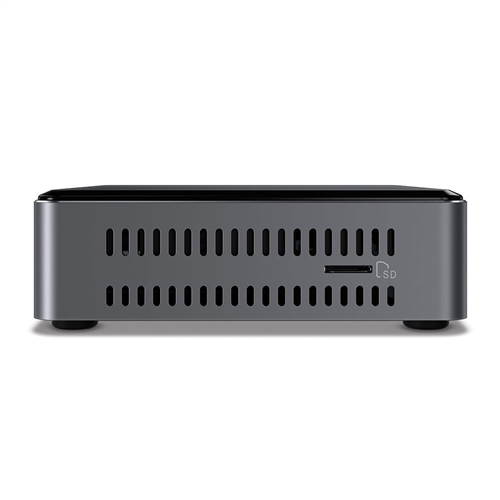 The kits also come with Thunderbolt™ 3 which supports up to 40 Gbps transfer speeds for your intensive data needs and has built-in 10 GbE for networking with another Thunderbolt 3 system. 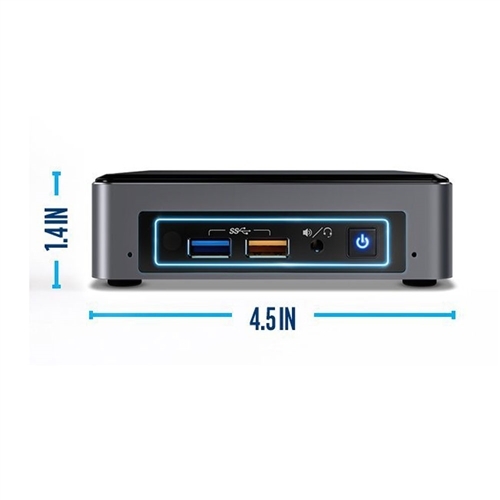 Both systems come with Intel® 802.11ac wireless, Intel’s fastest wireless available today, for connectivity right out-of-the-box. 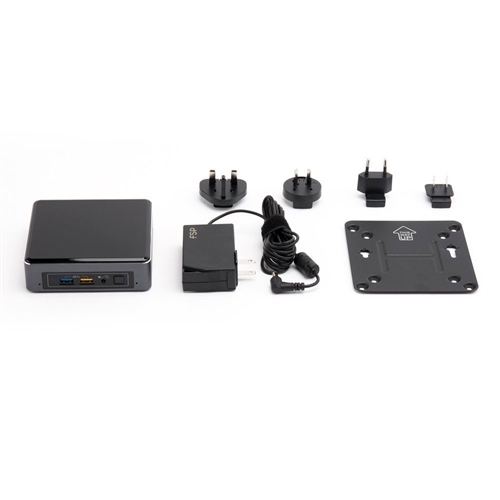 This makes it simple to immediately access files in the cloud, and with built-in Bluetooth* 4.2, you can connect wireless peripherals like headsets and keyboards. 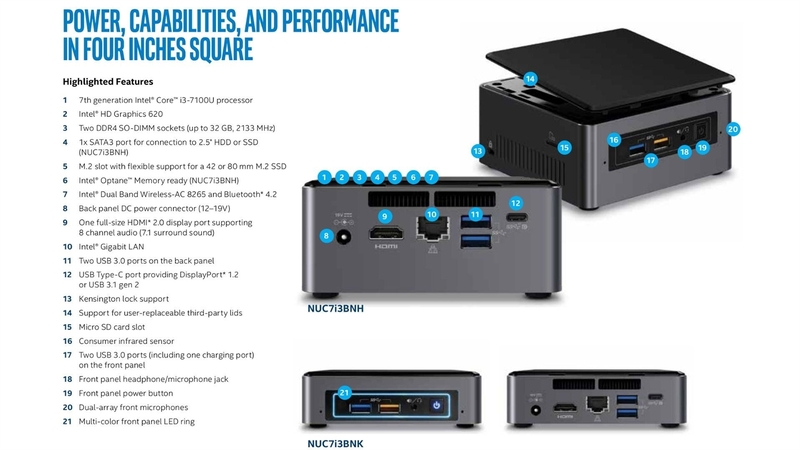 INTEL® NUC: Go small, get big. 4.53" x 4.37" x 1.38"
It was shipped with a failed Windows activation. It took Support a week to help resolve the issue. The issue was understandable, but the time to resolve was not. Otherwise I have had no issues with the computer and it shipped quickly.